Home Tags Posts tagged with "Massage"
Graduating from high school and beginning a post-secondary education is an important and exciting time in a young person’s life. College can be a lot of fun, but it also is a hectic experience. Students are under pressure to succeed in their studies and form new relationships. They also face the challenge of living on their own, perhaps for the first time. This involves buying groceries, washing clothes, and performing other tasks that used to be done for them. The stress that can result must be managed to avoid physical and psychological problems. Eating nutritious food and exercising are key to keeping the body working properly and maintaining mental health. Another way to find relief when pressures mount is to get a massage. This kind of hands-on therapy is an ancient method of relieving muscle tension, reducing pain, and promoting physical rehabilitation. The word “massage” comes from a French term for the “friction of kneading.” Numerous techniques have been developed for muscles, joints, tendons, ligaments, and fascia. Massage also is used to relieve symptoms in the vessels of the lymphatic and gastrointestinal systems. People receiving massages typically lie on a table or sit in a chair, though beds and floor mats are sometimes used. Practitioners employ their hands, elbows, forearms, knees, and feet to apply pressure to targeted parts of the body. They improve their clients’ mobility and help them regain other physical functions. People of all ages benefit from these treatments. They include those recovering from injuries and patients undergoing post-operative care. Others who have found massage worthwhile are people with cancer, heart disease, psychological afflictions, and disorders of the immune-response and endocrine systems. 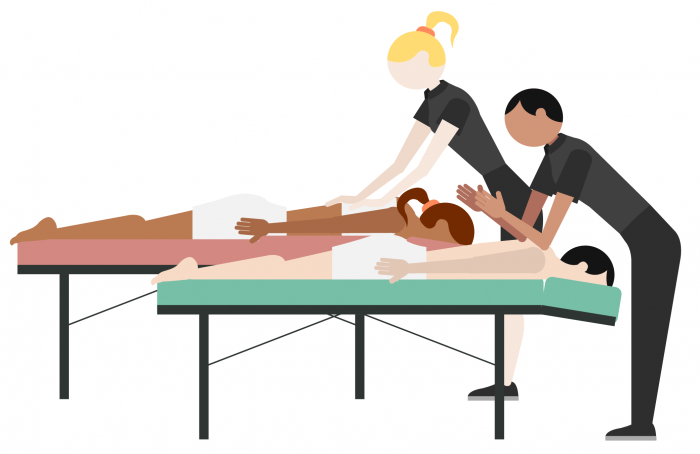 Massage is frequently incorporated in conditioning regimens for athletes and others whose activities can result in strained muscles and injuries. Treatments can be useful for people who strain their shoulders and necks while working on computers, and those with physical problems resulting from repetitive motion. The most common type of this therapy is Swedish massage. It involves the use of the hands to work on various parts of the body to relax muscles and loosen joints. This can be as simple as rubbing a sore muscle, which a person may be able to self-administer. However, professionals are trained to target the source of discomfort and apply the most effective techniques. There main kinds of Swedish massage are effleurage, featuring stroking movements on the affected area; petrissage, the grabbing and pulling of muscles; friction, the use of fingers in a circular motion to apply pressure; tapotement, involving chopping and tapping; and vibrasion, in which fingers are firmly pressed on muscles while the client’s body is shaken. While Swedish massage is most effective in relaxing the outer two layers of muscles, a more intensive method called deep-tissue massage is needed to provide relief in muscles that lie deeper in the body. This is often required by those whose pain results from athletics or other heavy physical activity. Deep-tissue massage involves slowly stroking across the grain of the muscles. Elbows, as well as hands, are sometimes used to apply the necessary pressure. Therapists trained in this type of massage know how to locate individual muscles from which a person’s pain or tightness originates. The goal is to zero in on “trigger points,” knots that radiate pain to other parts of the body. This neuromuscular technique improves blood flow, while relieving discomfort by decreasing pressure on the nerves. Acupuncture, the therapeutic application of needles in the skin, has used by healers in China for thousands of years. Acupressure involves the same trigger points, which practitioners identify as the source of patients’ pain or stiffness. Hands, elbows, and tools like balls and rollers are used to apply pressure. In addition to relieving pain, acupressure can lessen the nausea experienced by post-operative patients. It is widely believed that acupressure and acupuncture re-balance a person’s chi, a term relating to the flow of energy throughout the body. Another hands-on healing technique, reiki, is based on a similar idea. The term is translated as “universal life energy.” In this ancient Japanese ritual, energy is said to pass through the hands of the therapist to the patient. While generally provided in private practices and clinics, reiki also has been used in hospitals to help surgical patients and those receiving radiation treatments. It is a deeply spiritual, as well as physical, exercise. A rolfer works on myofascia, connective tissues that surround muscles. In many cases, myofascia are the source of back pain and joint aches. Patients typically develop such maladies as a result of bad posture or repetitive movements. Rolfing is an intense therapy, which can be painful because of the amount of pressure applied with hands and elbows. People seek out rolfers when other, less extreme, massage techniques have failed to provide relief. Patients undergoing hellerwork receive rolfing massage, as well as an education in improving their postures to reduce the damage to joints and muscles. The straightening, stretching, and massaging featured in hellerwork sometimes results in patients “growing” as much as an inch in height. The multiple forms of massage range from gentle stroking to painful pressure. These therapies can be emotional, as well as physical, experiences. Patients have been known to weep upon getting a measure of relief from their pain. This is considered normal, and experts advise not resisting the impulse to cry. The technique that works best for one person may be different than that needed by another. It is important to find a practitioner who can provide the most effective method of massage for an individual complaint. Students who get an occasional massage may find that they feel more relaxed, mentally and physically. Many have found that these healing techniques make it easier to deal with the stress of the college experience.